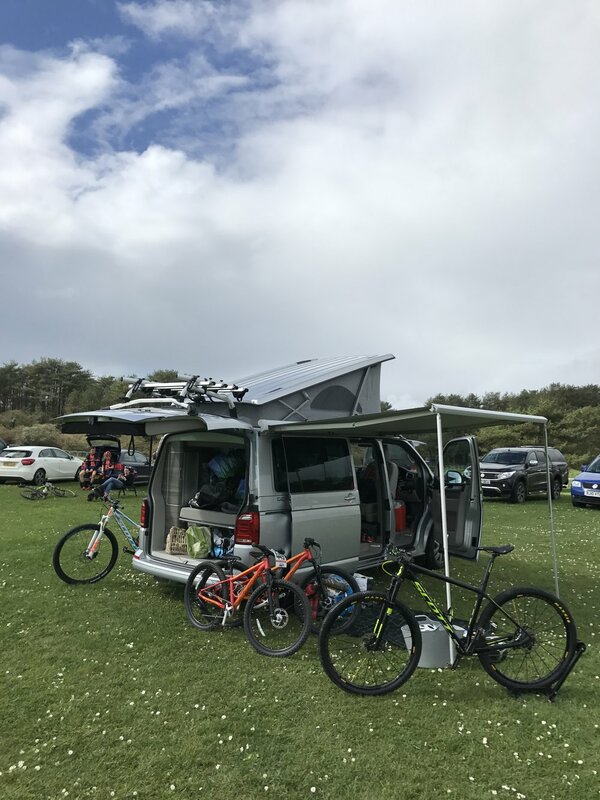 The VW California is the perfect companion for cycling events. "What a treat for the first NPS of 2017 – a literally brand new LokoCampers California T6 with only a few miles on the clock.. what a great start to the weekend! We collected the Cali on Friday which gave us time to load up before leaving West London for Pembrey, South Wales, early on Saturday morning. We arrived in good time after a smooth journey (despite the M4 closure), unpacked the Cali and spread our stuff and selves all over the place. LokoCampers had provided us with a tent for the car seats and this was a huge help in getting them packed out of the way once pitched up. The Cali had been spec’d really well with a number of additional and welcome features including upgraded stereo, factory fitted bike rack, heated seats, park assist and reversing camera, and interestingly Dynamic Cruise Control – there’s no going back on this feature on long motorway runs. A great addition. My race (Vets) was on the Sunday 10.45am but course practice is Saturday afternoon and fks (age 6) and aks (age 8) were due to ride their first ever NPS in the U8’s category on Saturday afternoon – lots of nerves, particularly for fks, in this regard! 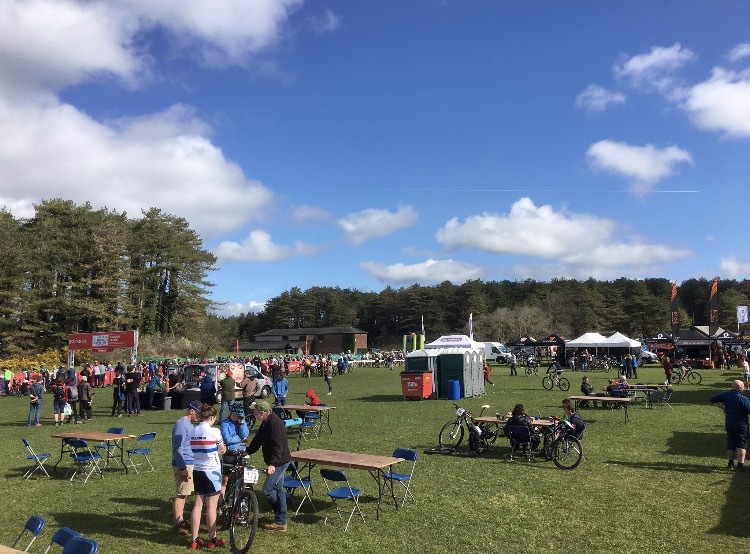 The boys did fantastically well in their event, a fun and essentially non-competitive event around a short course with a lot of children enjoying the atmosphere and the special circumstances of riding a marked course with a start/finish line and lots of cheering spectators. I felt I was in decent form after racing two stage races in Spain already this year but a light cold was niggling me. More a distraction than a hindrance. I went out for a few practice laps on the main course and immediately witnessed a very nasty spill at one of the more technical sections. This section was then cordoned off for practice and so didn’t do my confidence any good. I completed 3 laps and felt comfortable about the course. Two difficult technical sections and some very steep (but short) climbs. Race day came and it was fast from the gun. I was gridded 11th due to my ranking from 2016 but quickly lost a few places and settled in at about 20th place at the end of lap 1. Then the problems started. A few skipped shifts and by the end of lap 2 a progressive jumping of the chain and inability to find a working gear. Soft pedalling helped the technical problem but obviously not the race effort. To cut a long story short I ended up running with the bike for the last km or so of the race and finished 39th. Very disappointed and really no idea of my true level as not seen lap times yet. Still, 4 more rounds to make it up, but my hard earned decent gridding position gone for the next few rounds! The Cali on the other hand was epic. We love it and I can’t imagine a race weekend without it now. The children think it’s the best thing since sliced bread and I don’t know how we are going to be able to keep handing it back?!"